Sorry to go off subject but I read a few days ago that you took off all the side vines on the left of one of your plants. Can you tell me why you did that? Thanks for your time. The simple answer to that is that the left hand side of the plant had reached the end of the patch and had ran out of space. So what I did is terminated the vine so it wouldn't grow any more. About a quarter of the right hand side of the plant is terminated, but that side of the patch is wider so it will be a couple of weeks until that side of the plant is fully terminated. I've been adding fish fertilizer once every three weeks, two types of compost, one ffom the dump and the other a mushroom compost, I have been watering everyday on a slow drip, I apply miracle grow 30-15-15 as well as 15-30-15 about once a week alternating and occasionally do a foilage feeding with those. For potash I have been hardpressed to find a fertilizer high in potash so have had to begin substituting with bananas (I know lol) I'm thinking of making a sort of liquid fertilizer out of those until I can get my hands on some 20-20-20. The two questions I have are, can I still grow a big one without having prept the soil, and how does my fertilizer regime look? I'm not seeing any great progress with it, the fruit and the vine are about the same as they were a week ago, (the vine being about 7 feet long). Advice? M.D.it sounds like there could be a problem if the pumpkin is the size of a tennis ball still. At about 20 days old that pumpkin should really be taking off. The growth should almost be noticeable from morning to evening. Is the pumpkin shiny or does it look dull? If you touch it is it soft to the touch. I'm wondering if it aborted. Good soil really can't be substituted. I often say that what is done to the soil in the fall and early spring is 80% of the pumpkins growth. Using bananas at this point probably isn't going to give you what you want as they need to be broken down. How much miracle grow are you using? You should really be spoon feeding the plants very small doses if you are applying once a week. With fruit on the vine, you want something that is a little hirer in potassium and phosphourous and lower in nitrogen. Too much nitrogen is going to make the plant want to grow vines rather than fruit. How is the color of the plant? Do the leaves flag in the heat of the day? I'm also wondering if you might be over watering or under watering the plant. The vines should be growing fairly quickly right now, so for some reason that plant doesn't seem happy. Well as far as the texture, it it a shiny to medium dull, as well as moist to the touch, as well as fairly hard but eases just a bit if pressed hard. As for miracle grow, I'm using a tablespoon per gallon and giving each of my plants, including the pumpkin, about a cup full at the base. Color seems good, would like to see a deeper green as it seems ro be turning a tad yellow at some of the leaves at the base. Definitely not as green as some of my other more conventional breeds. Leaves aren't really flagging, they stand good and tall, except for in the hottest of days. Watering, I think needs to be on more of a scheduled basis, so I'm going to try for that, maybe a good soak on a trickle every other day? Vines are staying right where they're at unfortunately. I think what I'll try is some calcium in the soil (I've read this is necessary to help the plant absorb the nutrients) as well as potassium. If I can upload a pic soon I will, thank you so much for the reply! P.S. Would a complete transfer at this point to a better more prept location be at all feasible, with the small enough size of the plant, or do you believe this would be detremental and I should just try my luck where it's at now? Sounds like the pumpkin hasn't aborted then. 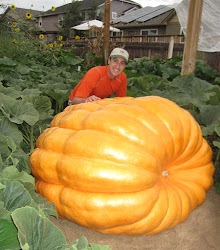 Send me a pic at http://seeds.denverpumpkins.com/contact/. I wouldn't transfer the plant at this point. I don't think it would survive that at this point in the season.